This video is compilation of the pictures that we clicked when we went to Amarnath in Kashmir, India in 2005. I know so old but memories are still fresh like it happened last year only. We started our journey from Delhi. Our first stop was at Patnitop, a cool, peaceful hill city and it lies among serene beauty of Himalayan trees. 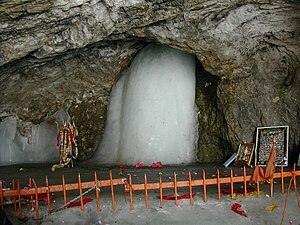 Next day we reached to Balltaal, it was the starting point for the Amarnath yatra of 21 km long. We thought of that various foods and liquid stuffs will be provided during this walking journey, but we found none. We had to eat ice directly from the Glaciers. Anyway somehow we reached to Amarnath cave, and it started raining there, then organizers, army police start vacating that place and said that nobody will stay here in night. All have to go back to the starting point in tents. So we rush towards the cave and after two hours we were ready to go back to down. But suddenly i started wondering where are my shoes, and as usual my shoes were not there. Somehow i found somebody else’s shoes that is fit to my size and we were fully ready by then. By late midnight we were back to the starting point and just laid down there. under a tree in the blankets that army provided. It was great thrill and adventurous trip that none of us could forget specially me because it was as tough for me to go there and come back. Hope you all will get the chance to visit that mesmerizing place at least once in your life.